Bow sights, or bow scopes, are tools that are generally mounted on a bow riser so that you are able to increase accuracy when aiming. Bow sights are similar to the sights that are used on guns. They are designed to assist hunters to obtain a higher degree of control when they are aiming their arrows at prey or game. As with any hobby or weapon, hitting a target with accuracy and precision takes time and practice. Sighting with your bow will maximize your chance of hitting the target and allows you to compensate for issues like gravitational arrow drop over distances and natural disturbances from the firing of the arrow and wind. 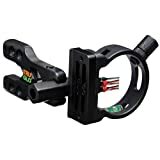 Below is a summary of some of the best archery sights available on the market today as well as some basic features included in today’s bows. 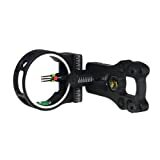 The best bow sights are incredibly beneficial for archery enthusiasts and hunters. When you think about it, the whole focus of archery and bow shooting is to be as accurate as you can be; whether you are a target shooter who is hoping for accurate shots from a number of distances or whether you are a hunter who is looking to make a clean and painless kill. 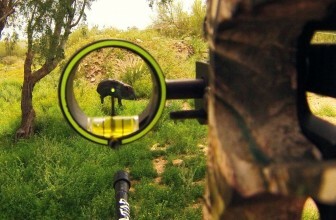 Fixed Pin: This is probably the most popular sight used among hunters. They are extremely accurate and simple to set up. The majority of fixed pin sights will allow for a number of pins to be added at varying yardages. In general, you do not want to exceed 4 pins as you will start encountering blind spots and other hindrances. Many hunters and enthusiasts will set a pin for 20 to 25 yards and then one for long shots and one for shorter. Once you have set your pins, it is time to learn how to compensate for the between shots. This takes practice. 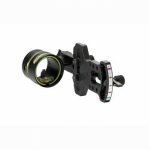 Moveable Pin: Often times a moveable pin sight will only have one pin. These sights are increasing in popularity and allow the user to adjust their pin for whatever distance they require. In order to use this type, you will need to practice gauging the distance between you and your game or target. One issue that people will encounter is that you will need to make adjustments to your pin and in real life hunting situations, your game will generally be in a constant state of movement. This is an incredibly affordable sight with a 4.2-star rating on Amazon. It has also been deemed as a best seller. The sight is made out of aluminum with a fiber optic diameter of 0.029 inches. The sight is easily adjusted to accommodate both right and left-handed shooters with markings for windage and elevation. Happy customers are very pleased with the price to quality ratio of this sight. The unit has been used for multiple applications and repeatedly without wavering inaccuracy. Users are pleased with this sight for both target shooting and hunting. Customers who were unsatisfied with this sight complained that it could not be installed on their bow with some users having their sight break after under 20 hours of use. Truglo offers their “tru-fusion hybrid technology” in order to combine carbon composites with aluminum for a wonderful strength-to-weight ratio. The hybrid construction is meant for durability as well as a “true-touch” coating that will end up transferring fewer vibrations in your shots. The 5 metal pins have long fibers. The bracket is reversible and has a multitude of mounting holes. The sight also comes with a push-button light. This sight has earned itself a 4.9-star rating and is affordably priced. Every customer who has purchased this sight is happy with it. Customers remark about the lightweight, bright pins, price, and adjustable pin light. This affordable sight carries with it a 3.9-star review. 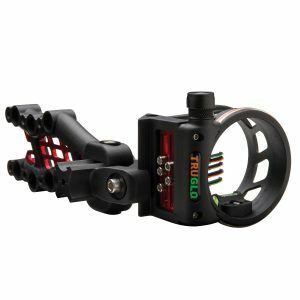 The Truglo Brite-Site Xtreme was designed with a large circular field of view that has a 2” inner diameter on the aperture. The pin guard is made of a lightweight composite. The level has two vertical bars and the shooter’s ring is glow-in-the-dark. 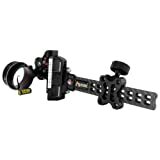 This fully adjustable sight is able to be used for both right and left-handed shooters. The Brite-Site Xtreme is designed for tool-less usage and is pre-marked for windage and elevation. Customers, in general, are very pleased with this sight. They are happy with the cost, ease of use and adjustment, value, solid mounting, and effectiveness. One frequent complaint is that it is easy to forget that your light is left on and it will burn out the batteries quickly. When you need to replace the batteries they can be difficult to locate. Large circular field of view. Aperture has a 2" inner diameter. Lightweight composite pin guard. Glow-in-the-dark shooter's ring helps align peep sight. Level with two vertical bars. CNC machined. Adjustable for left and right handed shooters. 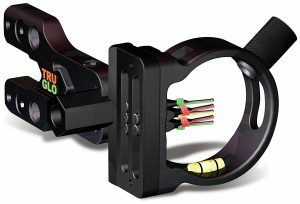 The Wizard 3 Pin Fiber Optics Archery Bow Sight is another extremely cost-effective. Customer reviews have it sitting at a 4.5 star rating. The lightweight design doesn’t add much weight to the bow and its bright fiber-optics assist you when it comes to accuracy and honing in on a target regardless of lighting conditions. The fiber optic pins are .029” and do not obstruct the sight visibility. The sight has a contrasting glow ring in order to allow you to remain focused. Customers have rated this unit highly indicating that it is a great quality to price ratio but they recommend the purchase of a light with it. 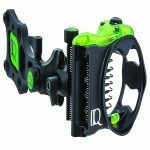 Every single customer that has purchased the Archer Xtreme Head Hunter Micro Xtreme Bow Sight has given it a 5.0-star review making it one of the best archery sights in its price range. This precision tool is well worth the price. 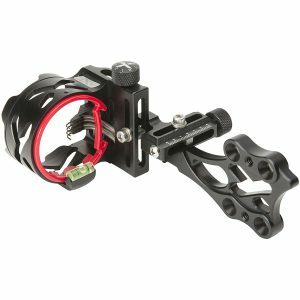 The Head Hunter Micro Xtreme Bow Sight is an easily and quickly set up sight that offers rock star performance. The sight is lightweight and durable and according to customer reviews, the best in its class. Customers who are both right and left-handed are praising the quality of this sight, loving its versatility and adjustability. They are pleased with the aesthetic appeal and the LED light with a push button on/off switch. The item ships quickly and customers are more impressed than they expect when it comes to the quality and the size of the pins. Customers were able to start shooting bullseyes within 10 minutes of installation. 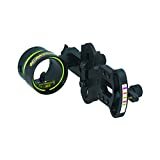 The Axel AccuTouch Carbon Pro Sight has earned itself a 5.0-star rating on Amazon. This is a single pin adjustable sight that has a clicking system when adjusting for specified distances. The sight tape is 45 degrees with 1st, 2nd and 3rd axis adjustments and it comes with an Axel x-41 scope. Although Amazon customers were reviewers of few words, there is definite satisfaction with this unit’s precision, ease of setup and use as well as its light weight. 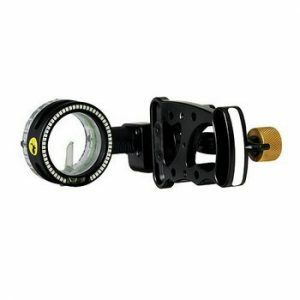 The Trophy Ridge Driver Slider Sight is a single pin sight that is rated at 4.1 stars with an affordable price tag. 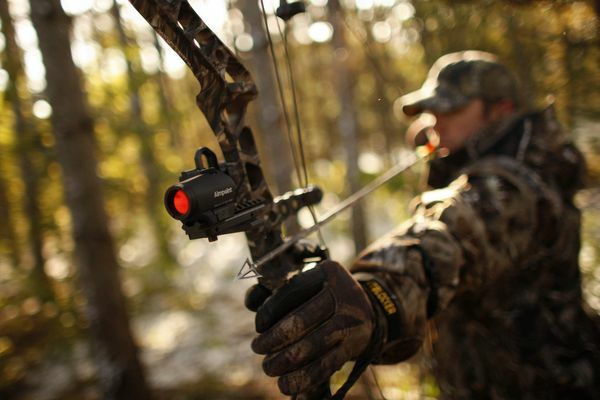 The Trophy Ridge includes a sight light and has an ultra bright .029” fiber optic pin. It has a bubble level and an adjustable indicator pin. Because of its nylon bushings, there is no metal-to-metal contact allowing for quiet, smooth movement. The customers who love this product are satisfied with its easy adjustments and installation as well as the price and quality. They are happy about the accuracy, performance and sight visibility. Customers who were unsatisfied indicated that the sight broke on them quickly, came with missing parts or that the Trophy Ridge customer service was unacceptable. This sight has earned itself a 4.8-star rating on Amazon with a reasonable price tag. Its 2” diameter housing offers an enlarged field of view to house its seven .019” pins. The Create Linkool-less design ensures ease of installation and uses while the detachable reversible bracket offers greater vertical adjustability. The bubble level allows for more precise shooting. Customers are entirely satisfied with this unit, claiming they were overwhelmed by the quality and were pleasantly surprised by the price to quality ratio. Many customers feel that the quality matches that of the more expensive sights. Others boast about the pin quality, ease of use, material, lightweight, and cost. The Trophy Ridge React 5 makes our list of the best bow sights despite it’s higher price point. It has received a rating of 4.6 out of 5 stars. This version comes in two colors, black, and camo. It features a Ballistix Copolymer System, which is 24% lighter than aluminum but is just as strong. It has a tool-free micro adjustment, rheostat light, built in sight level, .019 fiber optic pins, and a reversible sight mount. The reviews for this sight are really great. Everyone seems really happy with it, and quite a few people commented that the Trophy Ridge customer service was very helpful when if they were struggling with it. The tool-free adjustments seem to be one of the most commented upon features that people were very happy with. One of the things to consider seems to be the weight. Most people seem to love this sight, but do wish it were a little lighter. Overall, this sight appears to be a winner, based on the reviews. Very few complaints, and most people not only seem satisfied with this product, they’re extremely pleased. 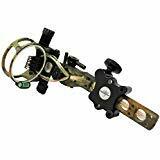 This cost-effective bow sight has received an average of 4.2 out of 5 stars, taken from 77 reviews. Some of its features include ultra-lightweight carbon-composition construction, a micro push-button light, a large circular field of view, a reversible bracket for greater vertical adjustability, and is adjustable for right and left-handed shooters. 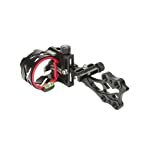 Most of the reviewers seem to have positive feelings about this bow sight for the price. Quite a few mentioned it felt a little flimsy but said it did the job and were happy enough with their purchase. Many people mentioned this was a great purchase and were very pleased with their decision. If you’re looking for a bargain bow sight, this may be a great choice for you. Ultra-lightweight carbon-composite construction. TRUTOUCH soft-feel technical coating. Micro push-button light. TRUFLO fiber design. Extra, extra-long fully-protected fibers. Large circular field of view. Aperture has 1.8" inner diameter. Level with two vertical bars. Reversible bracket for greater vertical adjustability. 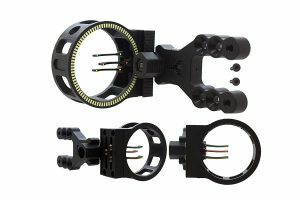 Glow-in-the-dark shooter's ring helps align peep sight. Adjustable for left- and right-handed shooters. This bow sight has received 4.6 stars out of 5. It comes in both right and left-handed versions and has quite a few helpful features. 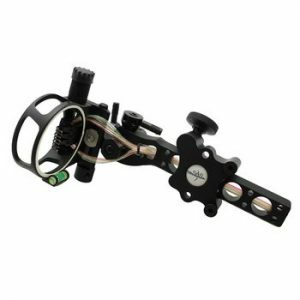 Retina lock technology, micro-adjust knobs for windage and elevation, stack tight pins, built-in sight level, tool-free locking knobs, and instant feedback technology, which controls muscle memory form and consistency. The review of this sight is really great. People seem to really love the retina lock, and it was mentioned many times positively. More often than not, reviewers stated it improved their accuracy. At least one reviewer stated that it was beautiful to look at! 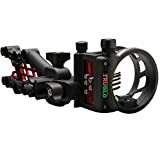 Very few negative reviews make it seem like this is a good buy for any dedicated archer who wants to improve their accuracy. ADJUSTABLE 2nd AXIS - Rheostat Sight Light accessory S15000 (sold separately). 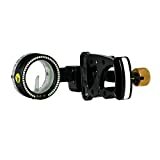 IQ Micro Bowsight Weighs 7.4 oz. 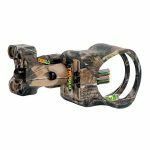 This bow sight has received 4.8 out of 5 stars. It has a sight in at 20 & 60 yards, and you’re dialed in from 20 and 80, in 5-yard increments. It also features a sight housing of 1 5/8”, fully protected fiber optics, tool-free adjustments, a fiber length of 5 feet, and includes a sight of .019. This sight has received so many good reviews that it was difficult locating a poor one. Fiber Optics: When it comes to target shooting and hunting, fiber optic cables have been put to good use as a sighting mechanism. The fiber optic cable has a small, bright tip that makes a great aiming point. Regardless of the time of day, the tip of the cable will stand out clearly. More often than not sight pins are on average a half inch to two inches of cable. Although pins come in a variety of sizes, the smallest being 0.19”, the majority of bowhunters prefer a moderately sized .029” pin. Gang Adjustments: This is a feature that will allow you to move all pins at once. Gang adjustments are a great feature to have if you would like the ease of use and setup. When a sight lacks this feature it is often more difficult to setup and adjusts because you have to adjust each pin individually for both elevation and windage. Aluminum vs. Plastic: More often than not, sights are made of aluminum. Aluminum is rust-proof, lightweight and readily available. With the assistance of CNC machining, sights can be manufactured with precision and intricacy. When you have a sight that is all aluminum, you can expect to pay over $50 at least. This is why many sights are both aluminum and plastic. Modern polymer sights dispel the old concerns of durability and can offer weight savings. As with many things, you get what you pay for. Why Use a Bow Sight? One thing you’ll find if you delve into the archery world is that most archers believe a bow sight is beneficial. Making your shot with accuracy every time is a far better result than the frustration of missing many times over, which can take all the fun out of the sport, along with wasting arrows. So not only can a bow sight aid in your enjoyment, it helps keep the cost of the sport down because you won’t have to replace as many arrows. If you’re trying to decide if a bow sight is a worthy investment, take a few things into consideration. If you’re missing a shot, what are the consequences? If you’re shooting at live prey, you run the risk of wounding the animal, and not killing it quickly, which is cruel to the animal. If you want to participate in contests, you may lose out on contest fees with no satisfactory result, which will be frustrating. You can also lose interest in a sport if you’re consistently struggling to hit your target. 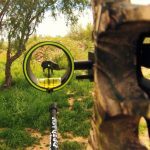 A bow sight can help rectify all of these problems and can be an inexpensive (or expensive, depending on which sight you choose) solution to your problem. 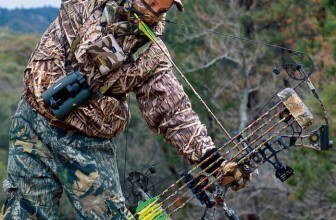 Take some time and shop around for the best bow sight to suit your needs. Happy Hunting! Single Pin Bow Sight or Multi Pin Bow Sight? There is much debate about which type of bow sight is best and it ultimately depends on your activity. For example, many hunters will argue that the best single pin bow sights are too slow for hunting situations. For example, if you have a Buck at 30 yards and as you pull your bow, the Buck gets spooked and moves to 40 yards, you’ll have to re-calibrate your site to adjust for the yardage difference. 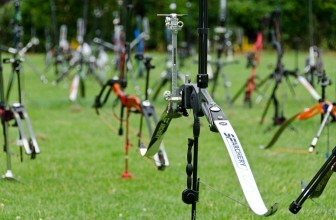 There is a multitude of high-quality bow sights available on the market today in varying price categories. It is not difficult to locate the exact type that you need. 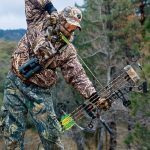 Whether you are an avid hunter who is looking to ensure that you are making a clean and painless kill, a competition target shooter who wants to hit that bullseye marker every time or are just beginning with your first bow and wanting to practice with your accuracy, hopefully this content was able to steer you in the right direction when it comes to choosing the bow sight that will meet your requirements.